Spool File Reports on the System i (iSeries or AS/400) platform are designed for being printed. But printing is expensive, both from a cost perspective as well as its impact on the environment. The best way to distribute reports would be in the "soft copy" format, which can be emailed to many people, and printed only when necessary. Systsoft Systems & Software has created Re-Distribute as an intuitive tool to convert spool files to Charts, Excel CSV and PDF and make them available to end-users through a web based interface and via email. * A spool file can be converted to PDF, either as a single document or split into multiple documents for distribution. Re-Distribute offers several Benefits , including saving of printing & postage costs, elimination of manual data conversion and ease of use. Market Samurai is a powerful tool which provides a lot of functions for market research, keyword research, back linking, and content finding. I have used the free trial version for a while and recently I have decided to buy the full paid version. Market Samurai is definitely the best market research tool I have ever used and is definitely much more then a keyword research tool. Market Samurai will give you a number of complementary tools to investigate any keyword in any market and to track your campaigns. Back links are very important when it comes to traffic and getting listed and it can be hard and time consuming to get them. With Market Samurai you can also find highly relevant back links for your site. Moreover with the Market Samurai you will also find highly relevant articles or videos to place on your site. Many times finding quality content can be time consuming but with the Market Samurai you can find high quality articles, pictures and videos in no time. This can save a lot of time. That’s still not all! with Market Samurai you can also help you to publish articles and blogs straight from Market Samurai. Market Samurai runs without problems both on PC and MAC and, even if it is not officially supported on Linux, I have personally used it on an OpenSuSE Linux installation without any problems. 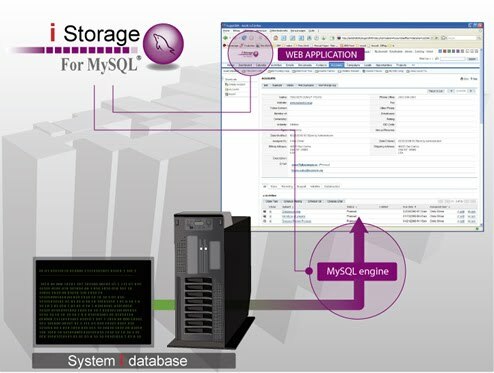 With iStorage For MySQL, PHP or .Net Applications use MySQL API, while company data is stored on DB2/400. iStorage For MySQL is a DB2/400 Storage Engine for MySQL. Data are solely stored in DB2/400 Database, reachable by MySQL applications, and also by OS/400 native applications. Everything is wholly limpid, and every system runs its own standards. Most of PHP applications already in used, are developed in relation with MySQL. When you install a PHP application on System i or Linux server, you can redirect tables from MySQL database to DB2/400, keeping PHP source code unchanged. Those tables are native DB2/400 tables, accessible from RPG or COBOL native programs. Vice-versa; developers make DB2/400 files accessible through MySQL API. There is no need of replication and synchronization, and no need to change files properties. PHP developers use the MySQL API they know to access DB2/400 tables. iStorage For MySQL is available for OS/400 and i5/OS V4R5 and up, compliant with MySQL servers on Linux or i5/OS. I found an interesting article on how to access the AS/400 database by using Ruby and ODBC. Recently IBM and some ISV presented at COMMON the new Open Access for RPG. Educational sessions presented by IBMers and sessions presented by ISVs such as Profound Logic and looksoftware were filled with interested programmers. For those who are not familiar with the open access feature, it uses the native RPG I/O access methods for accessing the native database (DB2/400 or DB2 for i) and outputs information to screens or other applications written in other languages and then allows that data to be presented in a browser rather than a 5250 screen. To accomplish this requires the use of a "handler," a different kind of data stream. IBM and the third-party vendors have created similar pathways for this end result for years, but this native method for using RPG is new. It's a different way to interface with XML docs, Web services, spreadsheet programs, databases, or cloud computing facilities beyond the iron that runs the RPG applications. Perhaps the greatest appeal is that it allows RPG programmers to use familiar I/O access methods to build the handlers that communicate with a variety of external devices. As far as I know, Open Access for RPG is not based on any particular third-party software tool that is being grafted onto the RPG compiler. What I can see is that tool vendors are going to have to have a very close look at the performance of Open Access for RPG and decide if they want to use IBM's plumbing or keep building their own. I have no idea how IBM is licensing Open Access for RPG, but if this is an open (meaning free, not source) set of tools, this could really shake up the application development and modernization tool space here in i-Land. It could also spur a whole new crop of tool vendors, who specialize in creating these intermediary transformation programs that can link RPG applications compiled in the updated tools so they can feed screens running on various kinds of devices. Logicmate has recently announced the UK availability of Profound UI, the very latest, and most significant, component of our IBM i modernisation suite of products. Profound UI is a full-featured graphical user interface platform based on IBM's RPG Open Access, the ground-breaking enhancement to RPG that opens it up to Web interfaces. The authors of UI, Profound Logic, worked closely with IBM to develop UI in conjunction with Open Access. RPG Open Access from IBM allows RPG-based applications to interface with the wide range of new devices and resources available today such as browsers, mobile devices, XML files and web services. Profound UI comprises a comprehensive visual design tool that allows anyone to create professional browser interfaces in a point and click manner. With the designer, developers can drag and drop user interface components, also known as widgets, onto the interface; then resize and edit their behaviour visually. The resultant rich display file, in conjunction with the UI handler designed to work with RPG Open Access, fits in with your RPG code as a display file to serve up your line of business applications as fully functional rich web applications. Profound UI introduces Rich Display Files -- native IBM i objects that incorporate the flexibility of the Web with the reliability of the i. Rich Display Files are created in a point-and-click manner and can be automatically connected to database files and program fields. These display files take advantage of IBM i's object-based architecture while delivering a capable graphical user interface. Profound UI uses the same top-down procedural methodology, native RPG operations, and programming techniques that IBM i developers are already familiar with. Because of its fully native approach, the learning curve for RPG developers is virtually non-existent.